But the clothes shops bordering the avenues near to the Grand Bazaar are the biz. The wedding dresses steal the show – mainly because of the hugeness of their puffy sleeves and the various add-ons – all designed to mean that most of a wedding day has to be spent getting dressed. 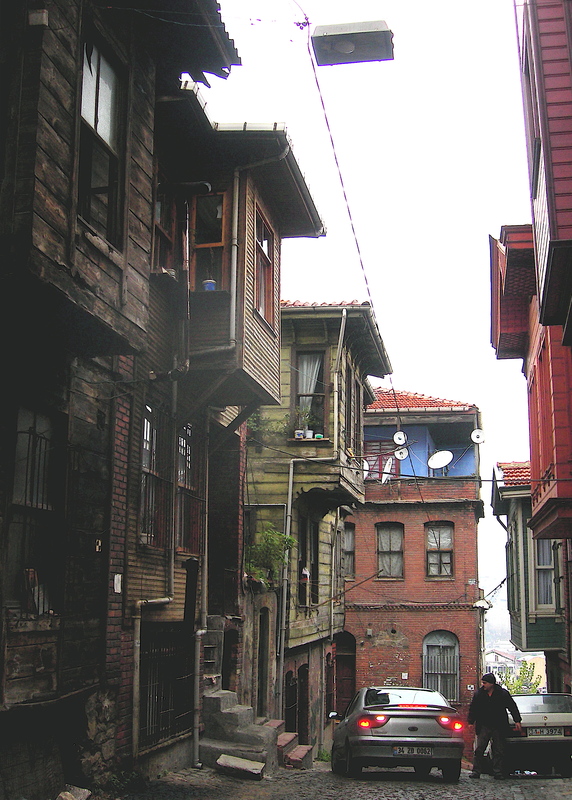 – The old wooden houses: You don’t have to walk far in the Suleymaniye district to find the old wooden houses. These houses are wonderful constructions. Most are falling apart and look like alternative film sets. Some architectural historians have been trying to get the world to pay more attention to them: as the houses fall into decay ‘a unique form of vernacular architecture is being lost’, and that ‘although some may argue that it is energy misplaced to save the wooden houses of Istanbul, considering the host of urban ills facing the city, these structures are of irreplaceable significance. They are the only remaining examples of Istanbul’s own domestic architecture, and represent building forms known from at least the 16th century.’ So, they are direct links with the Turkish past. – The music: I asked the young man at a CD stall in Beyoglu what was the best music in the whole of Turkey. “That depends,” he replied. “Well, I mean music that sums up the country…”. “Then you’ll need this …” He rummaged around and offered me the soundtrack to Fatih Akin’s film ‘Crossing the bridge – the music of Istanbul’. It turned out to be a perfect summary – a perfect choice. I’m listening to one of the tracks, ‘Ehemedo’ by Aynur Dogan, as I type. One of the reviews summarised the music as: ‘a broad spectrum ranging from modern electronic, rock and hip-hop to classical “Arabesque”.’ (There’s even music by a psychedelic underground band.) The CD stall man also produced some Turkish Sufi music, some Anatolian folk music and some Turkish blues. Those blues aren’t like anything I’ve ever heard before. Boats … and Istanbul: When you start to leave the city you can see hundreds of freighters and cargo ships in the sea of Marmara. For a moment they look like huge living sepulchres – or great monuments to trade and ingenuity. There they are, dignified and docile, silently waiting to load or unload the fruits of a hundred cultures. And as you leave the city – pushing further into Europe – there are hundreds of new apartment blocks going up… And as you leave the city going into Asia – there are huge industrial complexes and cement works and then the road opens up and you suddenly realise you want to start visiting Istanbul all over again. In the meantime, I’m watching the fabulous film, ‘Crossing the Bridge’. It’s Istanbul 1:26 a.m.